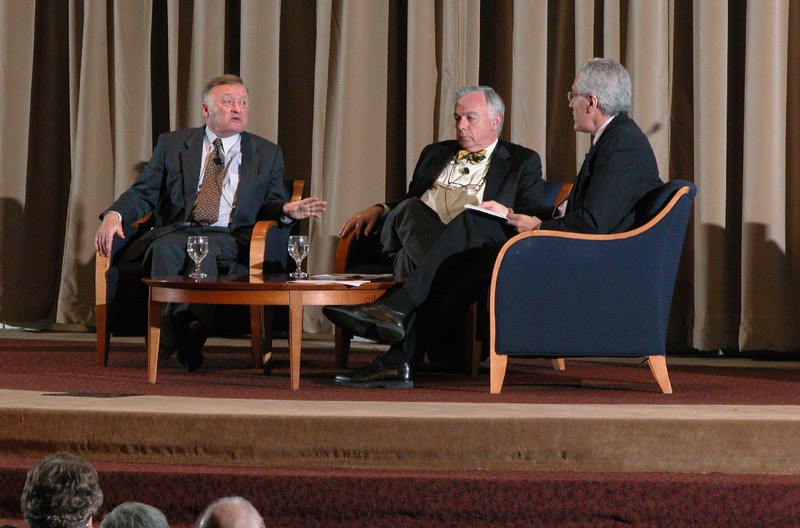 5:50 p.m., March 13, 2003--Fifteen years ago they would have been archenemies, but Wednesday evening, March 12, Paul J. Redmond, former chief of counterintelligence for the CIA, and Oleg Danilovich Kalugin, former major general of the Soviet KGB, took the stage together at UDs Clayton Hall to reveal some of the most intriguing episodes of espionage history. From left, Oleg Kalugin, former Soviet KGB agent, Paul Redmond, former CIA director of counterintelligence, and Ralph Begleiter, Rosenberg Professor of Communication at UD. Far from the popularized James Bond spy stereotype, these men look like average Joes, and their personas reveal nothing of the sinister nature of their jobs. Redmond and Kalugin were the men behind the missionsthe men who used counterintelligence to deeply infiltrate the deepest secrets of their respective enemy countries. Redmond and Kalugin painted a picture of espionage during the 40 years of the United States and Union of Soviet Socialist Republics Cold War, as well as offering some insight into the future of counterintelligence work. Their speech, Spy vs. Spy: Down and Dirty in the Espionage Trenches, was part of UDs Global Agenda Speaker Series, Spies, Lies and Sneaky Guys. Ralph Begleiter, Rosenberg Professor of Communication and Distinguished Journalist in Residence, moderated the event. The U.S. and the Soviet Union were locked in battle for supremacy, Begleiter said. The Soviet Union finally collapsed under their own political and economic failures. It was a war that ended without a shot being fired, but not without blood shed. 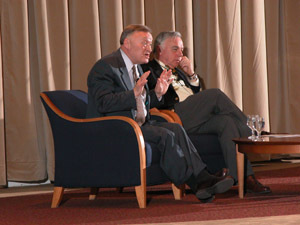 Redmond and Kalugin were each given an opportunity to speak and then faced off in a friendly banter about topics raised by Begleiter. The guests then participated in a question-and-answer session with the audience. Counterintelligence is an effort to bring sanity to a world thats very murky and full of spin, he said.  Intelligence cant serve a country unless at least the truth is sought for. Americans never get the point that people are going to spy on us. Its culturalwe dont like spying so we dont want to think about it. We dont like secrets either, Redmond said. Before retirement, Redmond served in several top positions for the CIA in East Asia, Europe and Eastern Europe. He received the Distinguished Intelligence Medal in 1994, the Federal Order of Merit from the president of Germany in 1995 and the U.S. National Distinguished Service Medal in 1999. He also served as director of the CIAs internal investigation of the Robert Hanssen spy case. Redmond acknowledged the KGBs deep penetration into the U.S. government during the Cold War. He said if the Soviets had not collapsed and a military war resulted, the United States would have lost. When you look at what would have happened if there was a war, it was terrifying, he said. We would have lost because the Soviets and the Hungarians had the lot. Redmond stressed that spying is still a large part of U.S. operations, even though the Cold War ended in 1989. He said since 1995, 96 significant spy cases have been uncovered against the United States. Furthermore, more than 80 entities have attempted to spy or successfully spied on the United States, including Germany, France, Greece, China, Iraq, Russia, Ghana, Ecuador, the Philippines, Saudi Arabia, Jordan and El Salvador. 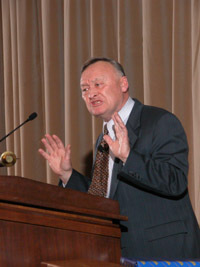 Kalugins speech centered on KGB methodology and ideology. He said during the Cold War, the Soviet government was focused on the United States as its number-one enemy. The KGB received solid support from the government, which asked no moral questions about the KGBs actions and policies. 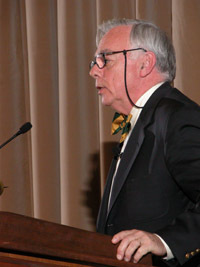 Kalugin infiltrated the United States as a journalist, attending Columbia University in New York City as a Fulbright Scholar in 1958. From 1965-70, he served as deputy resident and acting chief of the residency at the Soviet Embassy in Washington, D.C., quickly becoming the youngest general in the history of the KGB. Eventually, he became the head of worldwide foreign counterintelligence, serving at the center of some of the most important espionage cases, including the Walker spy ring. Finding that the KGBs internal functions had little to do with the security of the state and everything to do with keeping corrupt Communist Party officials in power, Kalugin retired from the KGB in 1990 and became a public critic of the communist system. He currently teaches at the Centre for Counterintelligence and Security Studies. Kalugin said one of his most effective spying techniques was pitting American citizens against their own government. We appealed to pacifists and told them, You cannot have peace unless you stop the internal situation of the U.S., he said. We got environmentalists and told them, Capitalists spend any amount of money even if it does destroy your precious nature. Well, at the time, the Soviet Union was the most polluted country in the world, he joked. Kalugin listed several astonishing facts from a classified KGB report, proving just how much the organization is committed to counterintelligence. He said that in 1981 the KGB reported that they had funded or supported 70 books, 66 feature and documentary films, more than 100 television stations, 4,865 articles in magazines or newspapers, 300 conferences or exhibitions and 170,000 lectures around the world. Little did you know, Redmond answered. In a discussion of the terrorist attacks on Sept. 11, 2001, both men agreed that the Al Qaeda organization could have been penetrated before the attacks, and Kalugin questioned why the CIA did not take more aggressive action toward infiltrating it. Kalugin said the KGB would have sent a Muslim agent or an individual posing as a Muslim into the network five to 10 years ago. Redmond responded by explaining the extreme difficulty of such a task, and the cultural differences that exist between KGB and CIA ideology. The Global Agenda Speaker Series is a program of the Universitys America and the Global Community initiative and is presented in association with the World Affairs Council of Wilmington. The next speaker in the series is Martha Neff Kessler, a former CIA intelligence officer for the Middle East and Southeast Asia. Her speech, Intrigue of the Mideast Bazaar, will be presented at 7:30 p.m., Wednesday, March 26, in Clayton Hall. For more information, check [www.udel.edu/global] or call (302) 831-2355.